Offering the perfect combination of convenience and luxury, the 5 Palms downtown condos feature 16 contemporary-style units situated in a premier location near all of the city’s best attractions. This upscale community offers a variety of amenities and luxury features for residents to enjoy. Featuring two- and three- bedroom units with over 2,500 square feet of luxurious living space, 5 Palms Boca Raton offers beautiful residences with high-end, contemporary styling. Features commonly found in these condos include but are not limited to spacious open floorplans, European-style kitchens with wet islands and stainless steel appliances, marble bathrooms, custom walk-in closets, wood flooring, floor-to-ceiling hurricane impact windows and doors, private access elevators, keyless entry, and state-of-the-art closed security systems. Condos at 5 Palms have private balconies offering sweeping views of the Atlantic Ocean, Intracoastal Waterway, and downtown Boca Raton. All of the units in 5 Palms are also pre-wired to implement the latest in smart technology including cable, high-speed internet, telephone, and sound systems. In addition to these lovely features, the pet-friendly condos at 5 Palms Boca Raton community provides residents with a number of on-site amenities to enjoy including a stainless steel pool, concierge service, valet service, dog walking service, and even a private gym complete with personal trainers to assist residents in achieving their fitness goals. For added security, 5 Palms features a secured garage parking area complete with closed circuit security. 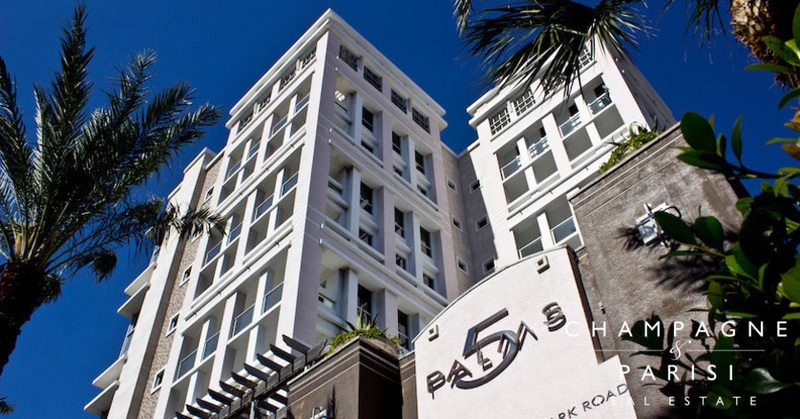 5 Palms is located in the heart of downtown Boca Raton, off East Palmetto Park Road on the West side of the Intracoastal Waterway. This spectacular downtown location is near a variety of fine dining, upscale shopping, and exciting entertainment options. Also located nearby are Royal Palm Place, Boca Town Center Mall, the world-renowned Boca Resort, and Mizner Park. Residents of 5 Palms enjoy being just a short walk from the gorgeous Boca beaches, as well as many of the area's beautiful community parks. If 5 Palms sounds like the perfect place to call home, you may also want to visit other nearby condominium communities, such as 200 East and Boca Grand, which also offer luxury condominium living in the heart of downtown Boca Raton. If you would like to learn more about 5 Palms or any of the surrounding downtown condominium communities in Boca Raton, please contact Champagne & Parisi Real Estate at 561-998-9015. You may also reach us by completing our simple online contact form provided below. We look forward to assisting you in finding your next dream home in Boca Raton! Also, please consider registering for a free account which will enable you to receive automatic email notifications when new condos in 5 Palms come on the market in Boca Raton, FL.